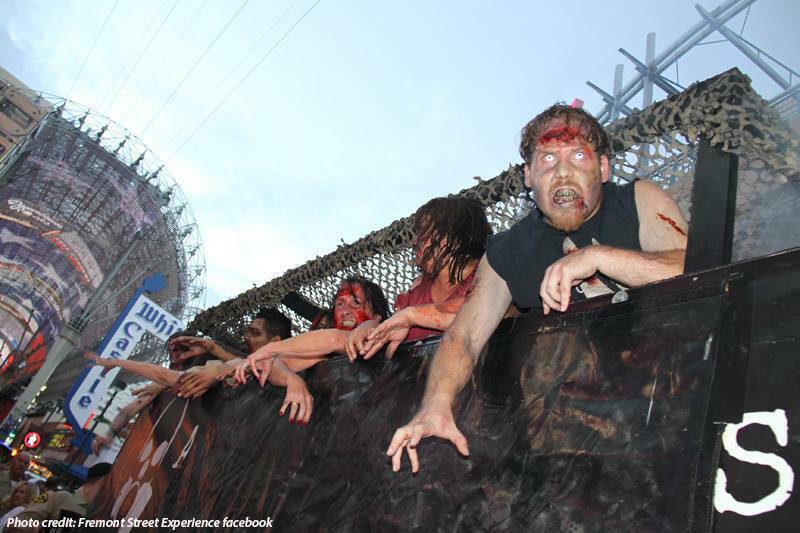 Fremont Street Experience introduced its newest spine-tingling attraction in Downtown Las Vegas, “Fear the Walking Dead Survival,” August 11. Inspired by AMC’s hit TV series, “Fear the Walking Dead™,” every element of the highly anticipated, zombie-themed walk-through attraction transports guests into a zombie apocalyptic world through a thrilling combination of motion rides, mazes, interactive videogames and non-stop fun. A collaboration between Fremont Street Experience, AMC and Triotech, a Canadian company known for producing technologically advanced, interactive award-winning attractions, “Fear the Walking Dead Survival” is a multi-sensory experience featuring elaborate sets, high-tech motion simulator technology and all-encompassing audio and video. Brave souls are invited to explore the inner workings of Fremont Street Experience’s military-controlled facility, set inside a junior college amidst growing rumors of an unknown, epidemic outbreak, and utilize their survival skills to fight off the never-ending zombies and escape the bloodthirsty hoard of the infected. “Fremont Street Experience is a tourist destination known for its unmatched variety of entertainment, making it the perfect home for this futuristic, immersive and interactive attraction,” said Ernest Yale, President and CEO of Triotech. Fans of the cult-following TV series will immediately recognize many of the attraction’s features, but even those unfamiliar with “Fear the Walking Dead™” will love the suspense-filled, exhilarating attraction – only available at Fremont Street Experience. “Fear the Walking Dead Survival” is open Sunday – Thursday from 1 p.m. – 1 a.m. and Friday – Saturday from 1 p.m. – 2 a.m. Tickets starting at $30 are on sale now.